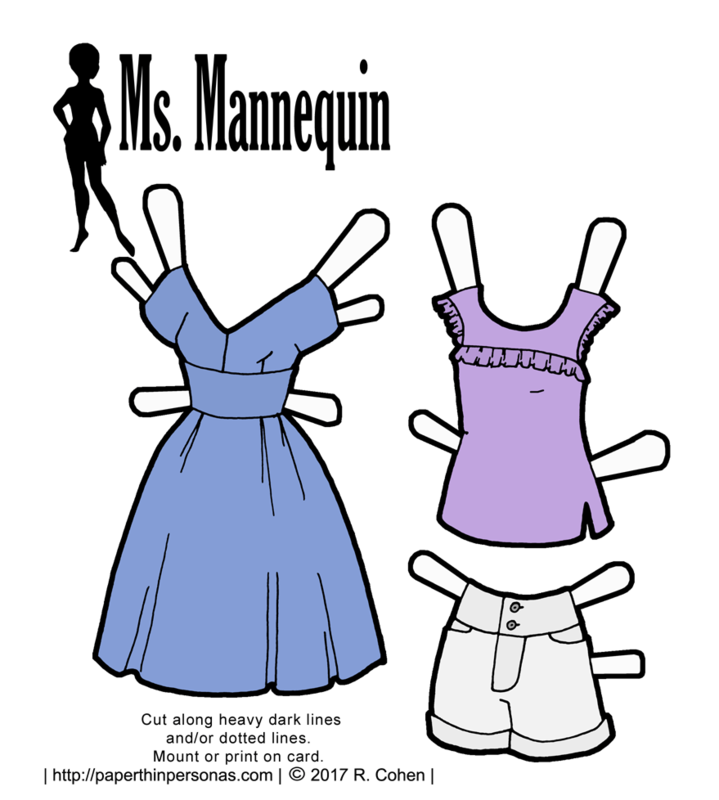 I’ve been wanting for a while to take the Ms. Mannequin printable paper dolls back to their roots a little. So today’s post is contemporary spring and summer fashions. Contemporary fashion was what I originally designed them to be all about. Personally, I think today’s summer paper doll clothes are what a fashionable girl might wear to a picnic. A super fashionable picnic- the kind with champagne and tiny sandwiches. I have never been to one of these. I really wanted to play around with pastels this time and embrace soft smoky colors. I was particularly excited with how the blue dress came out. It really reminds me of blue linen, though I have no idea why. Perhaps I am fantasizing about linen, because summer has finally come to Alabama. After a blessedly cold spring, we are now hitting the heat and humidity we’re known for. I very much dislike the summer in the South. I think I would dislike it less if my office weren’t always freezing. Books like 65 degrees and 40% humidity. People are not so keen on those temps, so I wear a cardigan to work every day and swelter in the jaunt from my car to the office. 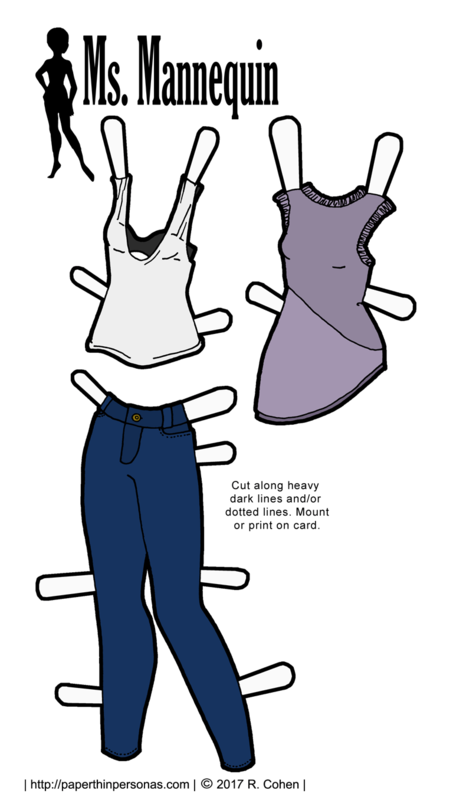 And now that I have managed to fill today’s post with complaining about the weather, which is basically the sport that rivals college football in Alabama, I would love to know what you think of today’s summer paper doll clothes. Leave me a comment ad let me know. Even years after I did them, there are a few specific paper doll sets that I don’t like that much. Usually not because of my drawing skill, I can let those problems go. I mean, I always do the best I can at that moment which isn’t the best I could do today, but skills improve with time. No, it’s usually color choices that I regret after the fact. One of the nice things about the project I’ve taken on to drew new paper doll content inspired by old paper doll content is that I can rectify some of those sets that I have mixed feelings about. One such set is Baroque Maiden. I did the color scheme that way I did it, because I wanted to experiment with darker color schemes. However, I really hate the color scheme now that I’ve had to live with it for 5 years. And the darkness of the colors means that there is no way to extract the line-work easily to make a black and white version. Plus it is one of the few pale skinned Marisole versions and those always look off to me. I much prefer Marisole with her original skin-tone. Anyway, I hope you like today’s re-imagining of Baroque Maiden. If you hop over to the Patreon page, I posted my sketchbook photo of this dress a few days ago. The post is open to the public, so check it out if you’re interested. And, as always, consider donating if you’d like to support the blog! I wanted to do something kinda this hip-hop inspired week I did for the Ms. Mann last year. Unlike last year, I didn’t really do much research this time. I wanted to draw some stuff that would fit into that genre without being specific to anyone of the many hip-hop musicians who have become fashion designers. Sometimes also called Urban Fashion, the style is defined by being influenced by contemporary city life and African-American culture. The word Urban is often a code-word for Black Inner-City Culture, such as Urban Romance. Personally, I have mixed feelings about this tendency in our society to avoid talking about racial and cultural differences by using euphemistic language. However, Urban Fashion is at least shorter and easier to write than Fashion Influenced and Evolved From Black Inner-City Cultural Elements and Then Made into a Commodity by Free Market Economic Forces. To return to the paper dolls, I think all of these pieces could mix and match well with what I created last year. The white tank would go well with these green pants, for example. The jeans would look nice wit this black and white tanktop as well. These cutoff shorts would be cute with today’s purple top. I left the space between the black bra and the white tank uncolored, because it should be colored to match the paper dolls skin-tone OR should be cut out very very carefully with an exacto knife or something. I leave the choice up to you. We’ll be ending the week with some steampunk styles tomorrow, so be sure to tune in (so to speak) for that and follow the blog on Facebook. 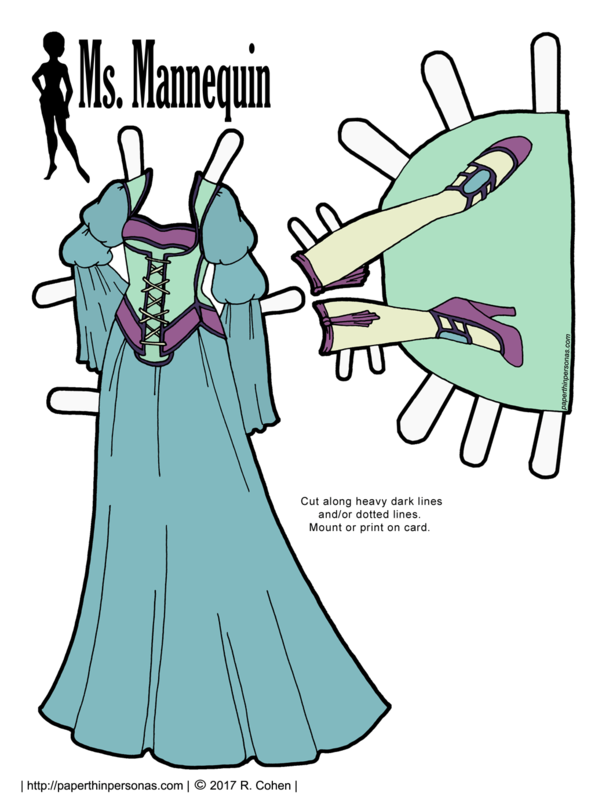 The gown today’s paper doll is based on was white and I felt like that wasn’t very interesting. Also, you can always use the black and white version of today’s gown to be the white version if you wanted too. What I really wanted to try to capture with today’s gown was the drape of the fabric clinging to the body and then flaring on the ground. 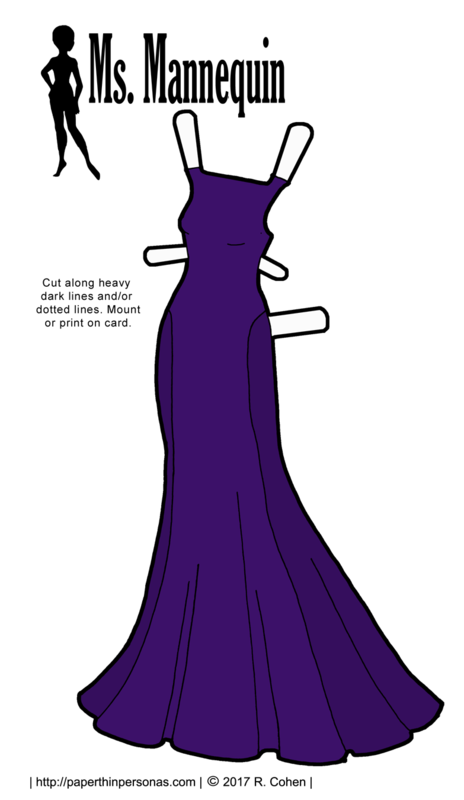 Another thing I loved about the dress I based today’s paper doll evening gown off of was the modesty. It is rare to see an evening gown with such a high neckline and thick straps, but I think it ads to the beautiful modernist style of the dress. A few house keeping things- If you like the blog and want to keep it on the internet and ad free, then please consider supporting it through Patreon. I haven’t been mentioning this as much as I was previously, because I worry that I’m bothering people. But consider this- 1 dollar a month is 5 cents per paper doll outfit. If you think the enjoyment you get from this little corner of the internet is worth a nickel a paper doll outfit, than hop over here. If not, I totally get it. I know a lot of my readers are under 18 and I know a lot are not in the US, so no reasons need be given. And if you’re wondering “where does the money go?” then check out this post from April about my first quarter income. It breaks all the expenses down. I hope everyone has a super wonderful weekend. Leave me a comment and let me know what your favorite paper doll this week has been? For me, I gotta confess a strange soft spot for the Space Pirates. Partly, because it is super fun to write the words, Space Pirates as often as I have gotten too. Along with the dresses, this set has two purses. I sorta thought the blue purse could go with the yellow dress and the pink purse with the blue dress, but I encourage you to pick your own favorite. Being that I live in the Deep South, the weather has been already very hot and very humid, even though it is just May. So, I think I maybe breaking out my maxi dresses early this year. I’m not much of a short dress person, but part of the fun of paper dolls is that they get to have wardrobes that maybe I wouldn’t want to have. I mean, I’m not exactly in the business of wearing dresses like this work every day. Unless, of course, my work was being an evil sorceress in which case… I would totally wear that dress. What do you think of these two dresses? Your style? I personally love the yellow one best, but what do you think? Also, there’s a new set of paper doll clothing in the Etsy store. Super cute summery outfits in color or in black and white for coloring. Check them out here. It is prom season and while I am not in an age group that is going to prom, I have noticed a strong trend towards crop tops and full skirts. While I did enjoy the proms I went to, I will openly confess that there is no force in the universe that could make me want to go back to high school. That was just a dreadful part of my youth. While I was helping a close friend shop for a wedding dress, I noticed a lot of prom dress styles were showing off the midriff. This isn’t a new thing, by the way, midriff revealing evening wear dates back to the 1940s- here’s one example from the movie Lady Eve. It’s a hard dress to find a decent picture of, I confess. There’s also one in Casablanca, but I can’t seem to find a picture of that dress. Sigh. Anyway, the point is the showing of your midriff in evening wear is not a new thing, but certainly hasn’t been in style for a few decades. It certainly wasn’t “in” when I was in high school heading off to Prom. That was the era of dressed based on the movie Titanic’s Jump Dress and also styles like this from Buffy the Vampire Slayer. Seriously, I knew at least three people who wore short satiny dresses under sheer layers to formals in high school. I had way to much fun drawing the huge oversized floral on the skirt of this outfit. 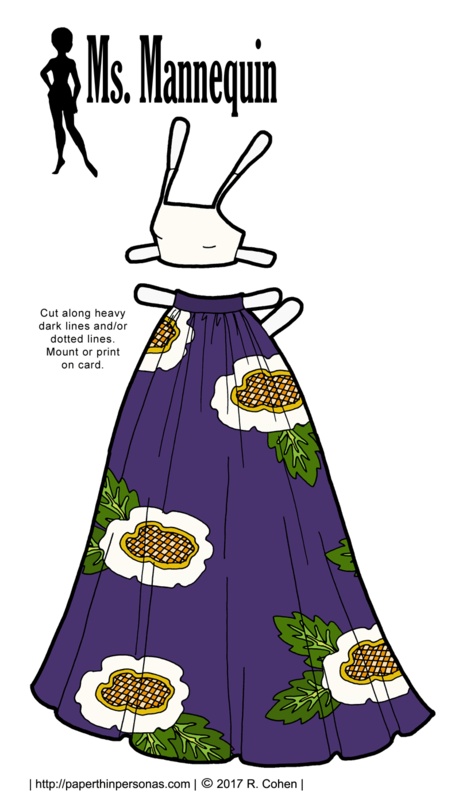 I really wanted something that the full skirt to accommodate, so giant floral seemed like it would be fun. Other then that, I’m just glad I got to share this dress before Prom season was completely over, though I strongly suspect it has mostly wrapped up by now. So, tell me fearless readers, did you go to Prom? I did, but not my Senior year. We had a joint Junior and Senior prom at my school. I also went as a Sophomore, because I was invited by a Senior. That was actually the most fun one since many of my friends in High School were older then me. Not bad memories, but, as I said above, no force on this planet could make me want to go back to high school. Like the blog? Want to help out? Donate and become a Patron. Let me be frank, I don’t really love the fashions of the 1970s, but they are starting to grow on me a little. There’s something about the bold colors and the big collars that I kinda have a fondness for. So, I might never been a die hard “1970s YAY” kinda girl, I am at least learning to enjoy some of the looks of the era. Last year I drew my first 1970s stuff and this year I wanted to continue dabbling in the era. While I think the Ms. Mannequin dolls look kinda odd as Vikings (their pose just doesn’t work), they make much better swinging cats of the 1970s. Both of these dresses are based on pattern cover designs. 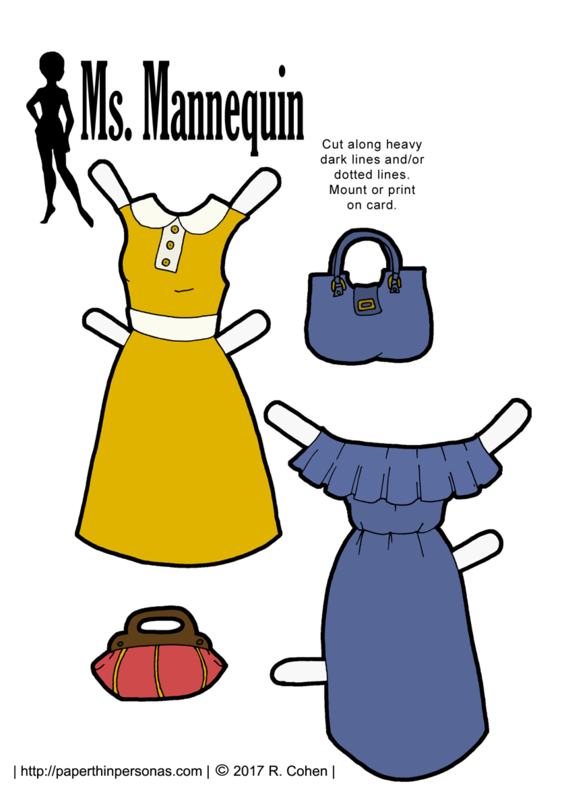 I love using vintage pattern covers to design paper doll dresses. They are usually pretty easy to draw from too, which I am grateful for. The dress on the left is from Simplicity 6605 and McCall’s 3936 and McCall’s 3936 which was apparently a “carefree pattern” which I think meant it was supposed to be easy to make. The dress on the right is from Simplicity 6605 which was a “how to sew” pattern. It would teach you, apparently, how to make set in gathered sleeves. These days, I use online videos when I don’t know how to sew something, but I suppose that wasn’t exactly an option in 1974. Also, I don’t sew people clothing. I am strictly a doll clothing sewing kinda girl. 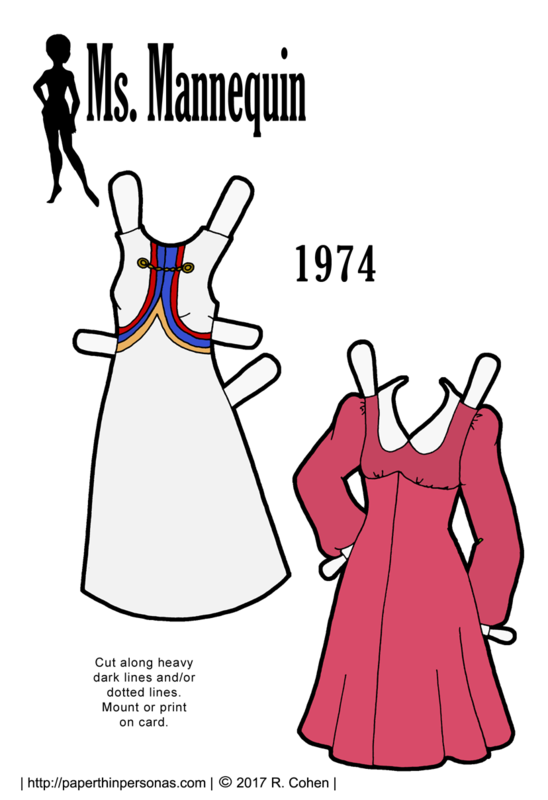 Well, what do you all think of today’s 1970s dresses? Is this a decade of fashion you really love? Do the Ms. Mannequin dolls need maybe a jumpsuit or something to do with their dresses? Let me know in a comment. What to help support the blog? Then join Patreon.